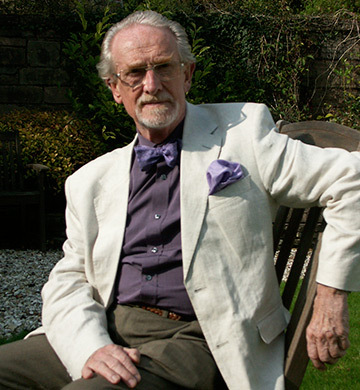 CHARLES ANDERSON has been one of Scotland’s most successful mural designers and Sculptors. Following a short period of as an Art Teacher after his graduation from Glasgow School of Art in 1959, he embarked on a career as a professional mural painter and sculptor for the next 30 years. This was mainly major Art and Design projects throughout the United Kingdom, carrying out commissions for a wide variety of clients including local authorities, property developers, banks and major insurance companies. His last project before he retired as a sculptor was the prestigious sculpture for Livingston New Town in 1996 which was the result of winning a national sculpture competition to provide a bronze figurative group entitled “The community” for Livingston New Town. Since early 1997 he has returned to the painting of easel pictures and has exhibited at the Royal Glasgow Institute, the Royal Scottish Society of Painters in Watercolours, The Royal Scottish Academy, and several exhibitions in London. Charles has works in various private collections throughout the U.K. and abroad. Charles was elected R.S.W. in November 2004. He served as President of the Glasgow Art Club for three years until February 2009. In 2014 in recognition as one of Scotlands most successful sculptors, The Royal Incorporation of Architects in Scotland awarded him an Honoury Felowship (Hon FRIAS) for his contribution to art in the public realm. Visitors to this web site will be able to view some of Charles Anderson’s recent paintings, some of which are for sale. There is also a section of the web site which provides information on Charles Anderson’s work as a Sculptor and Mural designer with examples of many of his murals. We are currently working on a project to expand this section to include many more examples of his murals and this will also include details of some murals which may be at risk as a result of more modern redevelopment projects.